What Kind of Champion Will Georges St-Pierre Be for the UFC Middleweight Class? The MMA world got its first look at Georges St-Pierre, Version 2.0, Saturday at UFC 217—and the early returns were spectacular. St-Pierre not only defied the odds by taking the UFC middleweight title from Michael Bisping via technical submission, he shocked us all with the style he used to do it. Conventional wisdom said St-Pierre would have to employ a steady diet of takedowns and top control if he had any hope of defeating the larger, stand-up-oriented Bisping. In other words, most everybody expected a vintage GSP game plan, utilizing the same strategies he used from 2006 to 2013, as he built a legacy as the most dominant welterweight in the company's history. What folks saw in the Octagon last weekend was something radically different. Instead of that safe and steady wrestling-based action plan, GSP largely fought—and beat—Bisping on the feet, ultimately using strikes to set up the rear-naked choke that rendered The Count unconscious near the end of the third round. In defeating Bisping the way he did, this 36-year-old reboot of St-Pierre simultaneously elevated expectations for the second phase of his career and stoked numerous questions about exactly what kind of middleweight champion he's going to be. Certainly there's no shortage of challenges for him at 185 pounds—including interim champion Robert Whittaker and a murderer's row of top contenders. On the other hand, trainer Freddie Roach has said he wants St-Pierre to return to 170. There is even some talk that this comeback could be one-and-done for him. For his part, GSP himself has been decidedly noncommittal about his future. "This is not really my real weight," St-Pierre told UFC color commentator Joe Rogan in the cage immediately after the fight. "I did it for the challenge." We know the UFC will want St-Pierre to unify the middleweight title by fighting Whittaker. UFC President Dana White said as much at the UFC 217 post-fight press conference. 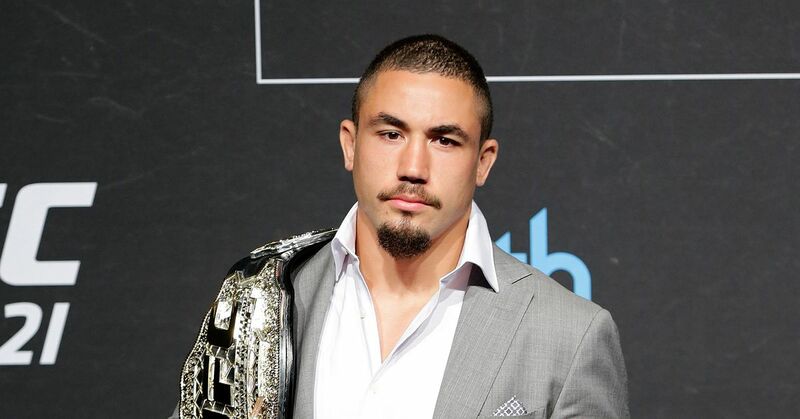 New Zealand native Whittaker, too, would no doubt like to score a lucrative matchup with St-Pierre, perhaps as soon as UFC 221 in Perth, Australia, on Feb. 11. Leading up to the Bisping bout, St-Pierre had also said that his new UFC contract includes the stipulation that he must defend the 185-pound belt. But against whom? Now that's a fairly vexing question. The answer will ultimately tell us a lot about how St-Pierre plans to approach this comeback. UFC 217 certainly gave us some clues. Perhaps most importantly, St-Pierre seemed refreshed and relaxed during his return to the Octagon after four years away. He appeared to legitimately enjoy the spectacle surrounding UFC 217, laughing his way through his final staredown with Bisping at Friday's weigh-in. This was in stark contrast to the guy who didn't seem to be having any fun during his final welterweight title defenses in 2013. When he announced his extended hiatus following a particularly hard-fought split decision win over Johny Hendricks at UFC 167, St-Pierre indicated the pressures of being 170-pound champion had taken its toll on him, psychologically as well as physically. The lengthy break looks to have done wonders for him. He even appeared more carefree inside the cage. St-Pierre's vaunted athleticism was still there. So were his crisp jab and the active punching combinations that found their way to Bisping's face more often than not. He even flashed just enough of his spinning kicks to remind us that before he fashioned himself into one MMA's best offensive wrestlers, St-Pierre began his fighting life as a kyokushin karate stylist. Was his willingness to mix it up on the feet with Bisping a sign that the new St-Pierre is going to offer a looser, more exciting product during his fights? Or did he just gamble that it would be too difficult to consistently take the bigger man down and therefore was forced to beat him with striking? If it was the latter, maybe he was right: St-Pierre had somewhat less success in the grappling department, where he was mostly unable to keep Bisping down. On the one occasion when St-Pierre did put himself in a good spot on the ground, Bisping cut him open on the bridge of the nose and forehead with a series of slashing elbows. If you squint hard enough, the end result of this victory might even be a bit troubling, if you are a St-Pierre fan. For starters, by winning the middleweight title, he's essentially put himself back in the same position that drove him from the sport in the first place. He's a UFC champion again, immediately faced with the task of warding off a gaggle of dangerous contenders. Second, while he was able to surprise Bisping on the feet, St-Pierre's biggest strength historically—his wrestling—was less effective. If he can't recreate the same striking dominance against younger, more dangerous middleweight opponents, does that spell bad things for him? Aside from Whittaker, the new middleweight titlist could face tough immediate challenges from former champions like Luke Rockhold and Chris Weidman as well as perennial top contenders such as Yoel Romero and Jacare Souza. Is he really going to want to do that? Now that St-Pierre is older and wiser, perhaps he'll have learned to handle the stresses of being champion better than he could before. If not, there is little chance that he'll be interested in diving back into the rinse-and-repeat schedule of defending the title against the toughest people in the world a few times a year. Luckily for him, there are numerous other big-money bouts at his fingertips. Depending on how things go in Anderson Silva's upcoming bout against Kelvin Gastelum on Nov. 25, perhaps the Silva vs. St-Pierre superfight that never came together during their primes could finally be booked. Bleacher Report's Jonathan Snowden has already thrown his hat in the ring in favor of Conor McGregor. St-Pierre and McGregor could conceivably meet at either 170 or 185 pounds in a bout that would no doubt shatter the UFC's previous pay-per-view record for buys. There is also welterweight champion Tyron Woodley, who lacks a clear-cut next challenger after Stephen "Wonderboy" Thompson defeated Jorge Masvidal at UFC 217. Considering what St-Pierre told Rogan, he may well still consider 170 pounds to be his "real weight." If he gave up the middleweight title and returned to his old stomping grounds, it would certainly be for a superfight against McGregor or an immediate title shot against Woodley. Does that mean it's unreasonable to think St-Pierre has designs on becoming the fighting champion the middleweight class has been hungry for since Bisping won the title in June 2016? Just as it has always been, it'll be hard to know exactly what's in St-Pierre's head until he decides to let the rest of the world in on it. What we do know for sure after UFC 217 is that after four years away from the cage, he's still got it. What exactly will he do with it?